April showers don’t always bring May flowers. 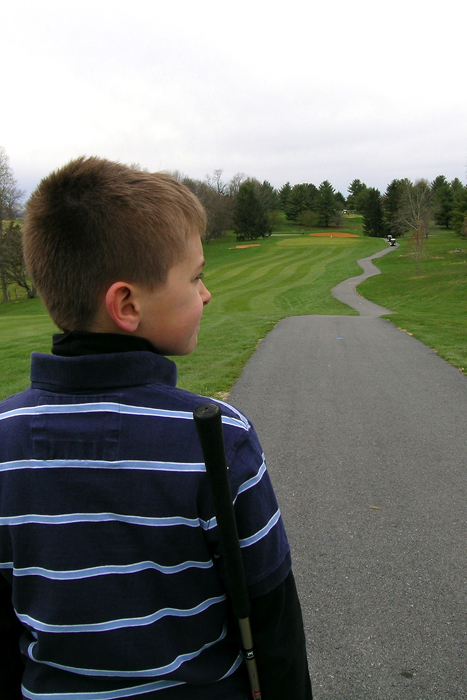 April also means it’s the official start of golf season—at least in our family. Well, let me clarify that: for me. My long-standing rule is that I don’t play golf unless it’s 60 degrees, so that usually means I don’t take out my clubs until some time in April. Although today was my first outing of the year, Cam and Gary have been playing off and on since the beginning of March. Today was a huge stretch for me. Not only was it still in the 40s when we left the house, but there were also dark clouds on the horizon. We all wore long underwear and turtlenecks. But it didn’t seem to faze Cameron, who played beautifully. The foursome in front of us even commented several times on his skills, and one player asked if Cam gave golf lessons. All I can say is that if Cam’s as much into golf as I was into horses at his age, then a little inclement weather won’t stop him from chasing his dreams, and that’s a good thing.